Hello there - I was slightly alarmed that you seem to think I am some kind of instrument of Askonas Holt. Of course it's true that Abbado and Rattle and Dudamel are represented by the same agent. As I understand it, Dudamel was taken on partly because of a recommendation from Rattle, which doesn't seem entirely unreasonable, if one accepts that Rattle has some idea what he's talking about. 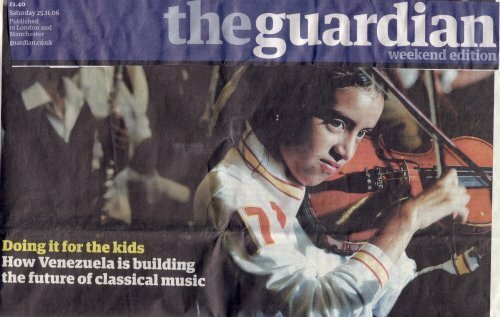 It would have seemed perverse not to have mentioned the fact that Abbado spent 3 months in Venezuela last winter, or that Rattle (left) has spoken highly of the System - just because they are represented by the same agency doesn't mean they aren't genuinely interested in what's happening in Venezuela, or aren't genuinely mentors to Dudamel. Anyway, be that as it may - that's not really my business. The point is that Askonas had nothing to do with the idea for this piece or the work I put into its execution or any of the costs that it involved. As far as I knew they didn't even know I was doing it; I didn't consider it their business. I mentioned the disc and the Edinburgh appearance because it seemed reasonable to imagine that the readers of the Guardian, most of whom are not about to fly to Venezuela, might want a chance to judge the results of the System for themselves. The fact that they are going to Edinburgh next year was let slip to me in Caracas - I can't imagine Askonas or the Edinburgh festival actually being very pleased about that being published ahead of the official announcement. I think your blog is terrific, and some of the points raised in this post are absolutely valid. Nor do I agree with Norman's analysis of the blogosphere. But I do totally reject the suggestion that I am some kind of tool of Askonas's global promotion strategy. I wrote the piece because it is a good story. Hats off to Charlotte, she is a fellow blogger and clearly understands the power of music blogs. She makes some fair points, although I don't buy "I can't imagine Askonas or the Edinburgh festival actually being very pleased about (tour information) being published ahead of the official announcement" as the link in my original post leads to an Askonas Holt webpage which says "The Simón Bolívar National Youth Orchestra of Venezuela come to the UK and Europe with their music director Gustavo Dudamel (above) ... and will perform in London, Edinburgh, Spain and Germany". But my main point was to highlight the link between record companies, agents, tour promoters and newspaper reviews. 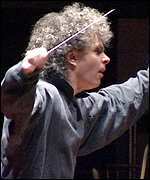 Charlotte's article gave a very favourable review of a concert in Rome in which Gustavo Dudamel conducted the Simon Bolivar Youth Orchestra, both of whom are clients of Askonas Holt, and both of whom had a major new release on the DG record label, a CD which was also featured in her article. In her response above Charlotte says "in a (very brief) visit to Rome most costs were borne by DG". So all credit to Charlotte for telling us that the record company paid for most of her trip to Rome, and for clarifying that Askonas Holt didn't pay for her Venezuelan visit (although their partners paid some costs). Now, in the further interests of clarity, can we be told who paid ‘most of the costs’ for the journalists (who didn’t include Charlotte Higgins) responsible for the glowing reviews of the Vienna premiere of John Adams' A Flowering Tree? – a work that will shortly be seen in London, Berlin and San Francisco. • DG is one of the classical labels of Universal Music Group, the largest record company in the world. As well as Gustavo Dudamel and the Simon Bolivar Youth Orchestra DG artists include Luciano Pavarotti, Sting, Sophie von Otter, and they own a major portion of the Herbert von Karajan back-catalogue. Other classical labels in the group are Decca, Philips and ECM. Universal Music Group had revenues of €4.989 billion in 2005, and controlled 25.5% of the music market. Their rock acts include U2, Shania Twain, and Mariah Carey. They also own one of the largest music publishing businesses in the world. • The link between Universal Music and ECM Records is interesting, and probably deserves a separate article. In August 2006 Charlotte Higgins’ colleague over on the Observer, Mark Hudson, took a trip to the annual ECM sales conference at St Gerold in the Austrian Alps, and wrote a glowing piece about ECM which said “Yet ECM remains a success, a commercial prize that many majors have tried to snap up …. ECM offers you the opportunity to (access classical music and jazz), but without taking on the establishment cultural baggage of traditional labels like Deutsche Grammophon.” Yet the Universal Music Group website says: “Record Labels – UMG’s strength and legacy of music flows from a diverse family of record labels which include … DG and ECM”. I was slightly astonished by your surprise when I read your original article Pliable. Do people really still suppose that the press retains strict impartiality in all its coverage of arts stories? It seems to me that there are plenty of obvious examples of publicity driven articles whose origins are to be discovered in the work of record company or management press officers, who’s job it is to attract as much media attention as possible. The arts sections of newspapers are as full as the airwaves with such infotainment. What are programmes such as Radio 4’s Front Row and Radio 3’s In Tune all about if not publicity? Perhaps it matters which section of the newspaper or on which type of radio programme such material appears. Or perhaps I’ve missed the point. By the way, I found Charlotte Higgins’ article most informative and inspirational. My response would be are we just going to accept that the press has abandoned impartiality in all its coverage of arts stories? Dear Pliable: I'm going to have to side with Guthry's comment on this one, and am frankly surprised (since you were in the recording business yourself) that you would be surprised by the idea that the "press has abandoned impartiality in all of its coverage of arts stories." Maybe it's different coming from the United States, but there's no such thing as impartiality in the coverage of arts stories here, and probably never has been. It's all driven by the market. Today, in key areas of public life, including politics and business we demand transparency, and declarations of interest. Even in the Guardian Travel section it is noted if a reviewed holiday is provided free by a travel company. Yet in the arts sector we are just accepting that impartiality has disappeared. Are the two holy grails of new audiences and sponsorship blinding us to what is really going on? Guthry and Sfmike are knowledgeable about the recording industry, and understand the hidden agendas below the surface of arts coverage. But more than 1000 readers a day arrive On An Overgrown Path from Google and other search engines. These are people who see a passing mention of Simon Rattle, Gustavo Dudamel and the Simon Bolivar Youth Orchestra in the Guardian or other media, and want to know more. 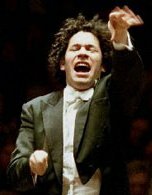 They have no idea that Rattle shares an agent with Dudamel, or that the Guardian concert coverage came from a trip paid for by Dudamel’s record company. If they did they would be interested – and surprised. I totally agree with Guthry that Charlotte’s article was inspirational. But to be informative it should also have covered the points above – which are all in the public domain. But perhaps that would have spoilt “a good story”? Charlotte has now blogged on this. Pliable, I think you are going too far in suggesting that the critics who went to Vienna for "The Flowering Tree" were bought and sold by the powers that be. I knew many of the critics there personally, and their publications were paying their own way. It is a strict policy at the New York Times never to accept any support whatsoever from outside sources. I follow the same policy at the New Yorker, and I believe that holds true for all serious American publications. I know less about the internal politics of English and European papers, but, again, I don't think the serious ones would print a "paid review." Most of the reviews of The Flowering Tree were in fact negative. Those of us who did write positively about the piece perhaps did so because we liked it. Alex, thanks for your clarification. But please read my post. I did not say the critics who went to Vienna for "The Flowering Tree" were “bought and sold by the powers that be”. Your response answers my question. But I asked the same question about the Dudamel concert in Rome, and it turns out that the critic in question was not paying their own way. So the question was hardly going too far. This debate has centred on travel costs, but it is useful to know whether concert tickets and review CDs fall within the definition of ”outside support”? A quick thought: When you pay for a ticket or buy a CD, you want to enjoy yourself and like what you hear even more than when it's given to you. Receiving the ticket frees you to be critical and not hoping to get your money's worth. These items aren't "outside support," in my point of view. Sorry to stick my oar in again - but on the last point, I disagree with 'M'; "Receiving the ticket frees you to be critical and not hoping to get your money's worth." On the contrary – a free ticket generally obliges the bearer to venture backstage after the performance to engage in various sycophantic activities. As pleased as I am to find others agreeing with me for once, I find the whole impartiality thing as depressing as it is unsurprising.